Skiing can put quite a toll on your feet since you are spending all day going up a mountain, whizzing downhill, and sending snow flying with your snowboards. This is why it is important to protect your feet from the cold or else you will definitely end up with sore feet, or worse; frostbite. Ski socks are usually overlooked when putting together the ski wear, and their importance is sometimes underrated. However, they play a crucial role in ensuring you are comfortable, warm, and can perform well on the slopes. Ski socks can’t be replaced by even three pairs of regular socks together since ski socks are designed keeping in mind the cold and water. They also fit well in ski boots, which can definitely play a role in enhancing your performance. 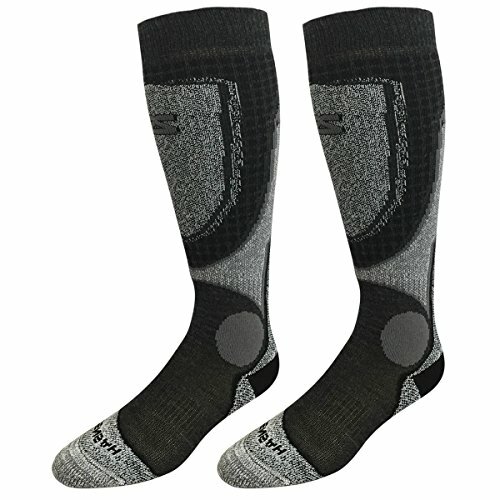 There are some types of ski socks that are the best in the market. You should invest in these to ensure that you have the most fun and perform well while skiing. Smartwool tops many lists for their amazing ski socks collection. The PHD edition is designed to provide you with light elite cushioning that gives you the comfort to conquer the steepest slopes. It also enhances your performance since you don’t feel the pressure of impact while skiing. They use the virtually unnoticeable toe to protect your toes from impact and reduces the risk of injuries. The material is made from ultra-comfy Merino, which provides warmth and is comfortable to use. They have a great grip and reach up till over the calf to provide support. They are made from high-density material that is created by 200 needles. Smartwool PHD ski socks are built for high-degree performance since they have an elite fit system. This helps your foot snugly fit into your ski boots. The aerodynamic design helps to make you faster and enhances the control of your skis. They also have a flex zone near the ankle joint that allows you dexterity and heightened control. The mesh ventilation increases the breathability of the material, ensuring that you don’t end up with damp feet at the end of the day. The patent-pending Indestructawool™ technology of the ski sock is designed keeping in mind the skiers who want minimum space between their boot and foot. The ski socks are a long-lasting item and will soon become your signature go-to brand. The Smartwool PHD is best for those skiers who want a high-performance sock at an affordable price. The 1112 Microsupreme ski socks are designed to enhance the comfort experienced by the skier. They adapt easily to the shape of the ski boot for maximum efficiency. The socks have a medium-weight that keeps your feet warm but doesn’t weigh you down. 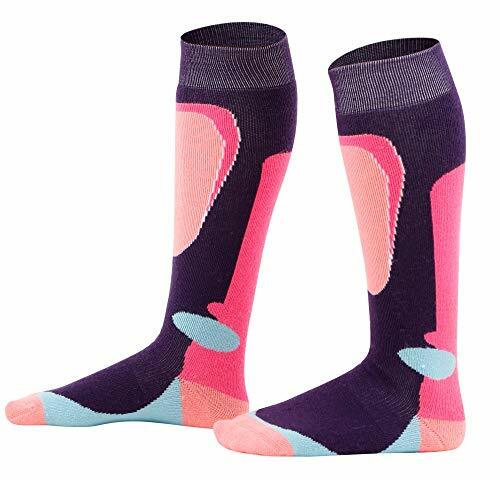 These one-of-a-kind ski socks have a dynamic thickness to them which gives the skier nice cushioning support. The thin design eliminates friction, which allows you to go faster. They are extremely soft, which provides comfort against the rigidity that most ski boots have. 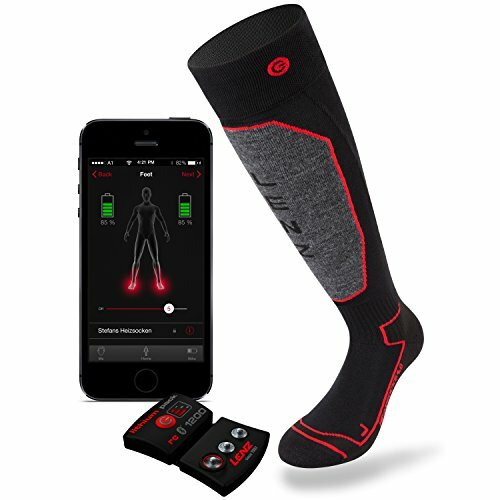 The ski socks are designed to support your leg in the best way possible. The cushioning support combined with the ankle brace and elastic arch band really helps the skier. It reduces the shock and provides ease in movement. The smooth toe of the sock also decreases the effect of impact on the toes. The sock may not be bulky, but it does provide maximum support to your legs. The socks are made with high-quality craftsmanship and exclusive materials, which ensures that you get the best product for your money. Treading around in snow and ice all day can make your feet wet if you don’t have proper protection; it may even lead to frostbite. The Eurosocks manage moisture through self-drying abilities and superior wicking. They keep your feet warm and dry. When you have dry feet, you are also at a lower risk of blisters. The Eurosock ski socks were designed for winter athletes using patented fibers. The company has woven elastic layers together to ensure that the sock stimulates blood flow to improve the delivery of oxygen to your leg. This reduces lactic acid production, swelling, and cramping. The Eurosocks 1112 Microsupreme is best for those skiers who are just starting off and may not have custom-fit boots. 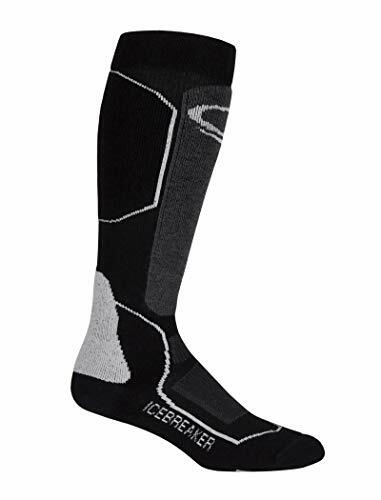 The Icebreaker Merino Ski Sock is a really comfortable ski sock designed to keep your warm and enhance performance. It has an anatomical fit that is different for the left and right foot. The uniqueness makes sure that there is no discomfort. It also reduces friction in the boot so that you can perform well on the slopes. The seamless toes function of the sock prevents blisters since it absorbs shock. This reduces the bulk at the front of the boot as well. The ski sock also has a cushioning effect that is sculpted against the shape of the foot. This maximizes the fit of the sock, as well as the comfort. It also gives you more control over your foot since you don’t have to deal with bulky socks. The ankle support of the sock also enhances the fit so that you have more control over the ankle zone. It has Achilles heel support so that the sock doesn’t slide out of place. The Icebreaker Ski Sock provides stability with the instep support function. It is optimized for ventilation as it has a breath zone. This ensures that your feet don’t get cold or wet and have space to allow the moisture to escape. 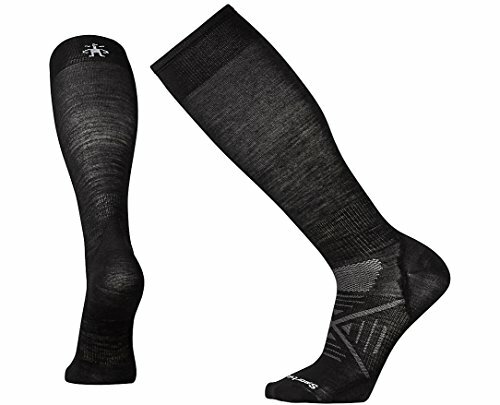 The merino blended fabric also adds to the comfort of the sock and enhances performance. The Icebreaker Merino Ski Sock is designed for those skiers who want to spend all day on the coldest slopes and need added warmth. The Darn Tough Vermont 5 OTC is made keeping performance in mind. They are designed to fit you perfectly so that there is no bunching or slipping. This reduces the risk of blisters and decreases friction in the boot. It also shapes itself against the design of the boot so that it fits you really well. The seams of the sock are fused with undetectable fusion which gives you an ultra-smooth feeling. The knitting follows a fine gauge technique that is unique to the 5 OTC ski sock. It enhances the durability of the socks so that they last you a long time. The merino wool used for the ski ha ultimate fibers so that you have maximum ventilation and can ski comfortably. The wicking is fast action and pulls the moisture away from the skin and into the sock. The fast drying action of the sock prevents your feet from getting cold or staying wet. The sock is also made from a natural anti-microbial material that reduces odors and repels bacteria in the foot. The Darn Tough Vermont 5 OTC is best for skiers who are going to the coldest mountains and need protection against heavy snow conditions. The Wigwam Snow Socorro ski socks have been used by professional and amateur skiers alike since the 1980s. They cushion the foot and leg with the incredibly soft material. 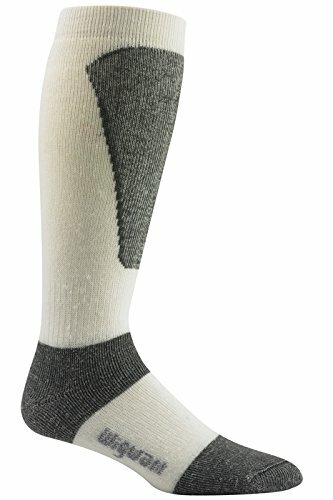 The durable synthetic fibers feel amazing and protect the sock from rubbing against the foot. This reduces the friction in the foot for enhanced performance. They also strive to protect the shin and feet from cold conditions so that your toes stay warm even in cold conditions. The reinforced shin adds another protection layer to the foot. It is an area that faces the most impact and needs as much protection as possible. The toe seam is also very fine so that the skier faces no discomfort. The Wigwam Snow Socorro ski socks are best for bluebird conditions. They stand well even in a powder snow day. 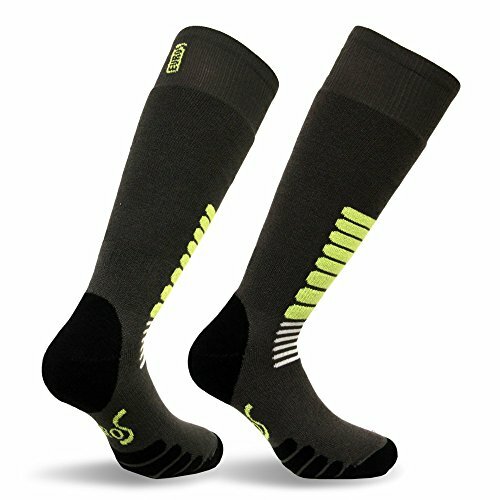 The Zensah Infrared is known for their unique and popular Infrared Ski Socks. The socks are made with a rare innergy yarn which aids heat generation and blood circulation. This makes it perfect for skiing since you need extra control over your feet to fly down the slopes. The perfect warmth also makes it easier to practice skiing all day long in the cold. The material of the socks is also incredibly comfortable, which means you won’t feel as tired at the end of the day. The comfortable sole enhanced the support of the sock and absorbs the shock of impact. The heavy cushioning prevents injury to the shin as well. The merino wool also has moisture wicking technology and eliminates odors. The sock comes with a no-slip cuff to reduce bulk, bunches, and friction. The Zensah Infrared ski socks contain natural heat generation. There is no need for apps or batteries with these socks around. The Lenz Lithium uses innovative technology to ensure that your feet remain warm even in the coldest regions of the planet. They connect to your smartphone with Bluetooth where you can tweak the Lithium battery powered heat generation. These socks will definitely keep you warm while you are threading through the snow all day long. It has additional shin protection which is often the victim of impact shocks while skiing. The ergonomically knitted sock supports the foot so that you have more control over your movement. The ring bandages in the ski sock also provide support while the extra padding on exposed parts cushions impact. It is best for skiers who stay on the slopes for a really long time and want to protect their feet from the cold. The Halconia Contoured Ski Socks are made from different blends of soft cotton. This creates extra comfort for the skier while trekking on the slopes. The sock is designed with no-slip bands so that there is reduced friction and bunching. The material is sweat-absorbent, which allows you to remain dry all day long. It has a quick-dry towel-like fabric at the base of the sock which transports the moisture away from the skin. The ventilation system comes in handy when you have to ski down slopes all day long. The contoured heel ensures that the sock fits perfectly in your ski boot. The heel and curved tip design alleviate the impact of shock and pressures away from the Achilles area. It is light-weight, which is perfect for traveling and participating in sports. 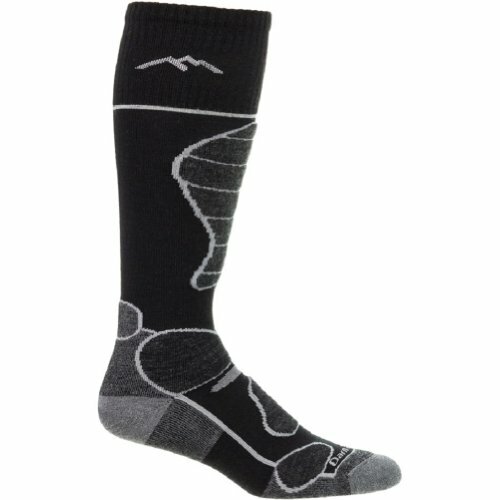 If you aren’t a regular skier, the Halconia Contoured Socks are perfect for you. They can be used for all sorts of sports like jogging, running, tennis, soccer, and more. Ski socks are designed to enhance your experience on the slopes. They can help you perform better and keep you warm. The ski socks are also designed to protect your feet from impact. It is vital never to neglect the importance that ski socks have during winter sports. Do make sure to invest in one of the high-quality ski socks mentioned above so that you can fully enjoy your time on the slopes.